Hollywood royalties set the bar high for the quintessential emerald cut diamond engagement ring. They flaunt 10 to 20 carats like it’s a requisite for future brides in La La Land! But let me assure you that you can have the same impact with a 5 carat emerald cut diamond. It will still look like the elephant in the room but you won’t have to spend as much as Kanye did! Despite all this digital knowledge at our fingertips, the impression that “the bigger the diamond – the better” is still pretty prevalent. Carat weight/diamond size still captures the eyes first. Well, if you have the money, you can go as big as you like. The important thing is you don’t neglect the other 4Cs! This post will merge two things: your love for big diamonds and how you can save money with the Diamond 4Cs. 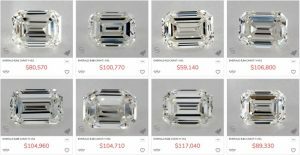 Read on and learn how to score a 5 carat emerald cut diamond that can rival with celebrity engagement rings – with just a portion of the price! Looking at A-list proposals from the past years, a particular diamond shape has become a fashionable go-to. The emerald cut was seen on Angelina Jolie, Beyonce, and Kim Kardashian. In the picture above, Dancing With The Stars contestant, Karina Smirnoff flaunts her Martin Katz 5 carat emerald cut diamond from now-husband, Jason Adelman. It may be trendy now, but it’s always been a classic. As an Art Deco gem, the emerald cut diamond’s dramatic yet straightforward brilliance makes it so mesmerizing throughout the decades! Your average 5 carat emerald cut diamond has 5% greater surface area than a 5 carat round cut diamond. Given apples to apples, the top surface of an emerald cut diamond will look more massive. This means that you can get a diamond that seems a little larger for a lower price. Aside from being humongous, emerald cut engagement rings are less expensive. You can expect to spend 15-25% less on an emerald cut engagement ring than you would on a round! Another feature women love is that it can make fingers look slender. Even with a 5 carat diamond, the elongated shape of an emerald cut will give the illusion of longer fingers. And this makes the engagement ring more pleasing to the eye! I’ve pointed out again and again that “Cut is Always King.” Although this time, we may need to lay low a bit because emerald cuts have a subtler sparkle. So, it would be wise to put more emphasis on Diamond Color and Clarity. Diamonds with optimal sparkle are known as brilliant cuts, while the emerald shape is known as a step cut that creates flashes of light called the hall of mirrors effect. A 5 carat emerald cut diamond may not be as sparkly as a round, but the edges of a well-cut emerald should still have a unique sparkle! With 50 to 58 facets, the emerald cut tremendously exhibits clarity and whiteness. But to best benefit from its size, it should also have a quality cut grade. Although emerald diamonds are yet to be graded by GIA for cut, the table below should help you narrow down your choices. These proportions will guarantee that your diamond reflects the light beautifully and is well-balanced by the carat weight. By simply dividing the length by the width, we get the ratio. And the higher the number, the longer and thinner the diamond will be. Although I would recommend a length to width ratio of 1. 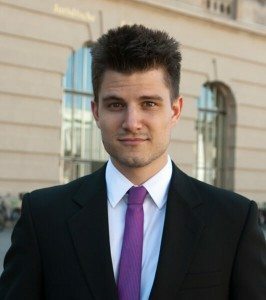 30 to 1.50. So, if the cut is not the 5 carat emerald cut’s best feature, how do we truly appreciate its beauty? Well, we don’t have to look deep because the surface of the emerald diamond yells loud and clear that it’s meant to showcase its façade that emanates a colossal window! The catch is that any flaw at the center will be apparently visible to the naked eye. Since a 5 carat emerald cut has large open tables and step facets, I would advise a high clarity grade. Opt for a VS2 or VS1 and stay away from SI2 diamonds as the inclusions will be seen with the naked eye. Step Cuts like Asscher cuts and Emerald cuts aren’t cut for brilliance, so there won’t be a light dispersion to somehow hide the flaws. Additionally, a 5 carat emerald cut diamond is more likely to reveal color due to its enormity and shape itself. You’ll see no trace of color in the D-F range no matter what the cut is, but H-K colored diamonds will display a slightly warmer tint on an emerald cut! Like clarity, color is more visible due to its large table and step cuts. This shouldn’t be an issue if you enjoy warmer tones, but if you want to stick with icy-white, I would recommend a G color grade as you wouldn’t see much difference if compared to the D-F range yet spend way less. Here’s a pro tip: Opt for a lower color grade in the H-J range and match it with a yellow or rose gold setting. This trick will make the diamond seem whiter than it actually is! Since we inspect diamonds with our eyes, it’s just apt that we shop from a store that can offer the latest technology to view diamonds as a gemologist would, topped with a stellar reputation and quality diamonds, of course! I can name a few diamond online shops that fit the bill, but my current favorite is James Allen as they provide 360° HD videos for all their diamonds and high-tech imagery up to 40x zoom! This way, I’m able to filter, see which is eye clean, and compare diamonds thoroughly in a smooth digital gallery. You got the carat weight and shape in the bag! 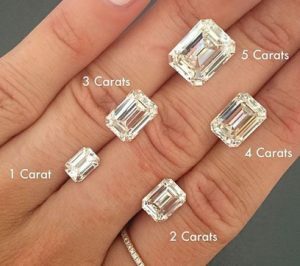 All you have to do is make sure your 5 carat emerald cut is within the suggested cut proportions, has a G color to still achieve the icy-white effect but not overspend, and is eye clean! After all, where else can a whopping 5 carat emerald cut diamond showcase its hall-of-mirrors magic – than in a spotless canvas?